The link to the photos has changed! The correct link is here. Terry & Roger’s photos are now online! I have finished processing the rest of the photos and have posted them to my on-line store. In the store you can view the photos and place orders for your favorites. After you log into the store you can gather your favorites into an album so that you can go back and see them. You can also send photo cards to others so that they can see your favorites. All ordering is done directly on the site! You may select from several print sizes as well as wall art sizes. There are also a number of novelty and gift items available. With the click of a button you can turn an image into a black & white photo or color them in sepia for that old time look. There is even a ‘retro’ look available on the site. I can enlarge images to better ‘zoom in’ if you leave specific instructions when you order. I’ll review all images before printing them and will adjust color and lighting. If you know anyone in the greater Capital District who is getting married please pass along our name & phone number – 518-225-6306. We’d love to help with their wedding too! 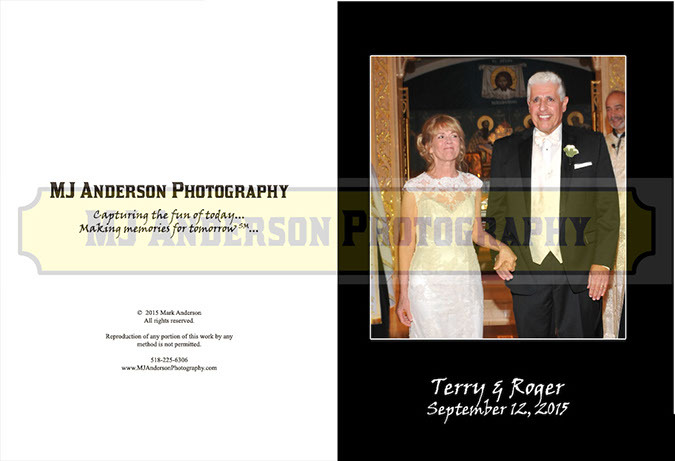 Terry and Roger’s Wedding Book is now ready for viewing! Some albums seem to build themselves! I have noticed that after some weddings I may need a little extra time sorting through the images, selecting the best ones and designing an album. For some weddings, like Terry and Rogers, however, the album seems to come together all by itself! With such a beautiful church, a great reception location and wonderful people the creation of a wedding book that tells the store is made much easier! Here then, for your viewing, is Terry and Roger’s Wedding Book! You may click on the link or on the preview image. Now that the album has been completed I will post all of the images from the rehearsal and wedding to my online store where you may order prints of your favorites! I’ll add another post when those are ready.